“I’m thinking about all of the memories that I had, but I feel I have got to the point where I have to pass the torch on to the younger people,” the 33-year-old Collins stated. In addition to winning the 100m gold medal at the 9th IAAF World Championships in 2003, and a bronze in the 200m, at the 2001 Edmonton Wrld Champs where he was locked in a tie with USA’s Shawn Crawford, Collins was the Commonwealth champion at 100m in 2002 and reached the finals in the 100m or 200m at the Sydney, Athens and Beijing Olympic Games. “It has been an incredible journey for me in track and field. Starting out almost 17 years ago, it was a journey that almost had no destination. I never thought in my wildest dreams that I would be a World Champion. “But I think I have done what I was supposed to do, and I think someone else needs to win that Olympic medal,” he said. The announcement comes a mere two days before St. Kitts-Nevis, which has a population of slightly more than 40 000 people, celebrates National Heroes Day. Collins said that he is confident the young athletes coming up would be able to step into his shoes and represent the country on the international stage as he has done. Collins said he has not decided exactly what his future plans would be, but stated that he planned to enjoy being in his home country on a permanent basis again and possibly working with local athletes. 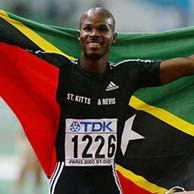 Officials from the St. Kitts-Nevis National Olympic Committee [SKNOC] , the St. Kitts-Nevis Amateur Athletics Association and the government all congratulated Collins on his many years of honourable service to the country both on and off the track.